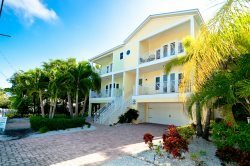 Club Bamboo 223 ~ A lovely 1 bedroom beachfront vacation rental at Club Bamboo South on Anna Maria Island. Located on Bradenton Beach, Club Bamboo South offers guests a private beach and outdoor pool. Amazing Gulf Views Watch the water roll in while laying in the king bed. King bed and sitting area. Sleepersofa. Kitchen and living area. Great TV. Stainless appliances. Enjoy a cup of coffee in your suite each morning. Enough area to make a dinner in. Enjoy relaxing on your private porch. Walk down stairs to the beach. Community pool. Pool area. Outdoor seating available. Relaxing beach area. Building view from beach. Building view from road. This beachfront vacation rental is perfectly suited for a family of 4 or a couple looking for a weekend getaway. The rental is in Bradenton Beach and equipped with 1 California King and 2 twin sleepers. The balcony features a fantastic view of the Gulf of Mexico where you can enjoy some of the most spectacular sunsets in the world, or a cup of coffee in the morning as the light breaks on the beach. Private beach access and a gated pool are included in your stay. The kitchenette has a full-sized refrigerator, microwave, counter top range, coffee maker and a breakfast bar. Club Bamboo is fully equipped with everything you will need for a one night getaway or an extended stay. Come and make yourself at home.